"I do absolutely think it is voter suppression to try and trick folks this way," Cameron Wimpy, research director at MIT Election Data and Science Lab, said of the Facebook ad. PolitiFact gave the party's claim its lowest possible rating, a "pants on fire" rating. It's hard to interpret this in any way except that it seeks to discourage people from voting. But voting will not cost anyone their hunting licenses. People with out-of-state hunting licenses get to keep their licenses; the warning only applies to people with residential licenses in another state who recently moved to North Dakota. Voting would not make those null, but establishing residency in another state, which is a prerequisite to voting, might, depending on the state. The ad employs a ridiculous argument. We rate this statement Pants on Fire! 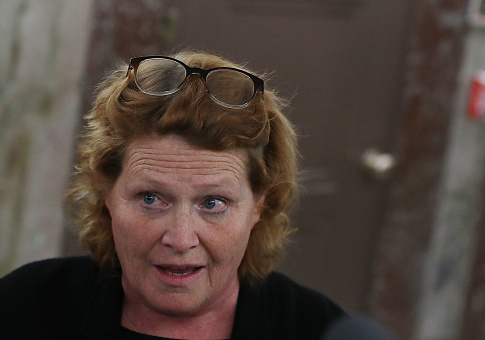 The Republican Party has a chance to gain a Senate seat in North Dakota, with incumbent Democrat Heidi Heitkamp trailing Rep. Kevin Cramer (R., N.D.) in recent polls. This entry was posted in Politics and tagged 2018 Election, Fact Check, North Dakota, Politifact. Bookmark the permalink.